I've been spending a couple of quiet moments, thinking how I could celebrate Mother's Day without my mama or lola here with us. Sweating, diffused and uninspired due to some mishandled issues with some projects where I am busy with. Though there are some things which should be cheering me up, like having my new Samsung fridge (10 in,two door, inverter model), getting nice complements from my readers and having more time with kids at home, there is still that emptiness I just couldn't pin point. Is this a longing for my mom's or sister's company or just the recollection of my most indelible experience at my lola's old house in Bohol? It's part of a song from Natasha Beddingfield's Pocketful of Sunshine. 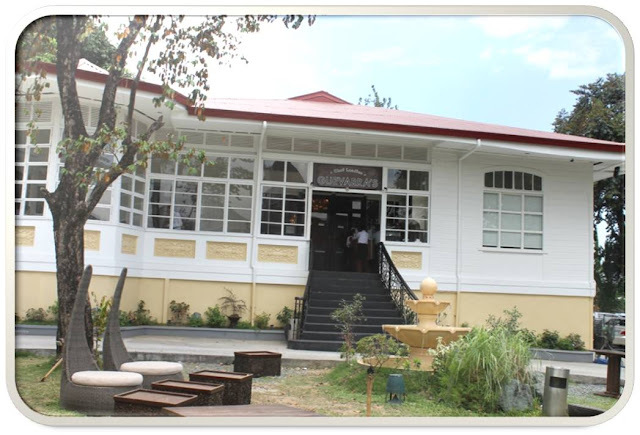 Getting a bit nostalgic, I remembered about the place along P. Guevarra, where I had lunch with a friend and had a talk with one of the country's celebrated pastry chef, Chef Jackie Laudico. As my way to introduce this barely new restaurant on a non-commercialized venue, let me entitle this place as My Pocketful of Sunshine. Chef Laudico Guevarra's is a new dining place that is completely an all-you-can-eat buffet serving authentic Filipino dishes. Why do you think I called it My Pocketful of Sunshine? 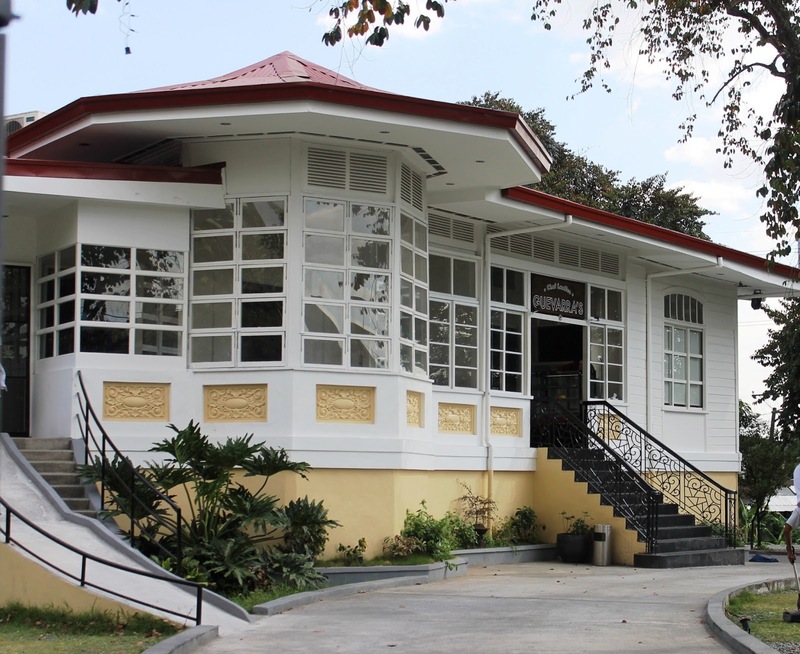 Not only that the owners were able to preserve the original look of the house inside and out, the owners of the restaurant were able to turn it magnificently into a lavish dining venue. Second, it's the perfect place to bring families and friends, even kids. You enter a fairly wide hall with adjoining rooms at both sides. Four of those were transformed into what else, dining rooms, and at the far side of the house is the fiesta buffet. 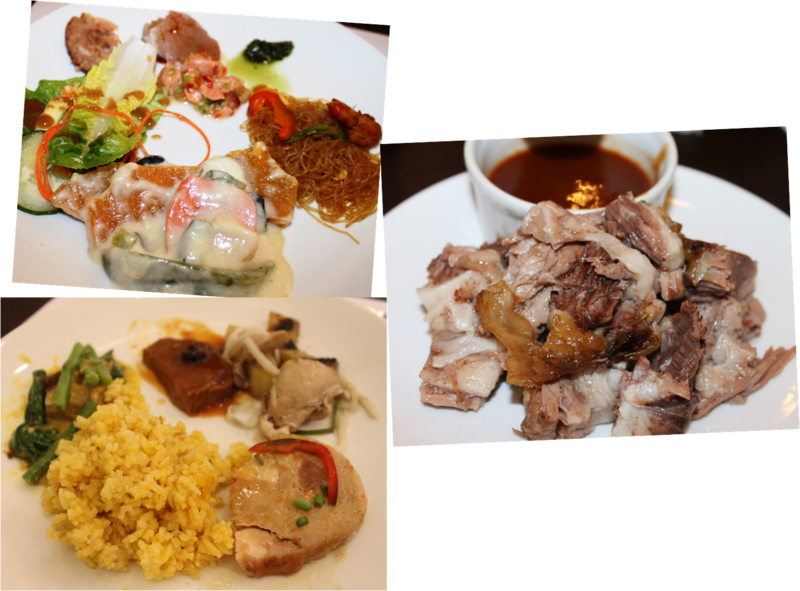 A smorgasbord of your favorite Filipino dishes prepared the way your Lola or your Lola's cook would, will definitely attract you. You would even feel the aroma wafting around the hall welcoming you and telling you that this is a comfort zone. With the excitement, I forgot to take note of the number of dishes that lined up the long buffet table. The carving station located at the far end seemed to entice the diners even more with Angus Beef Tapa which the Laudico's are famous for, and some other roasted meats.. They have an assortment of cheeses and cold cuts. You won't even know how or where to begin. A variety of salad also adorns the table. Also make time to look for gindara, or raw salmon (sashimi), and their yummy version of Kinilaw. I love their condiments, my favorite is this Malungay Basil pesto dip and the guava vinaigrette. Of course, how can you beat a meal without rice. 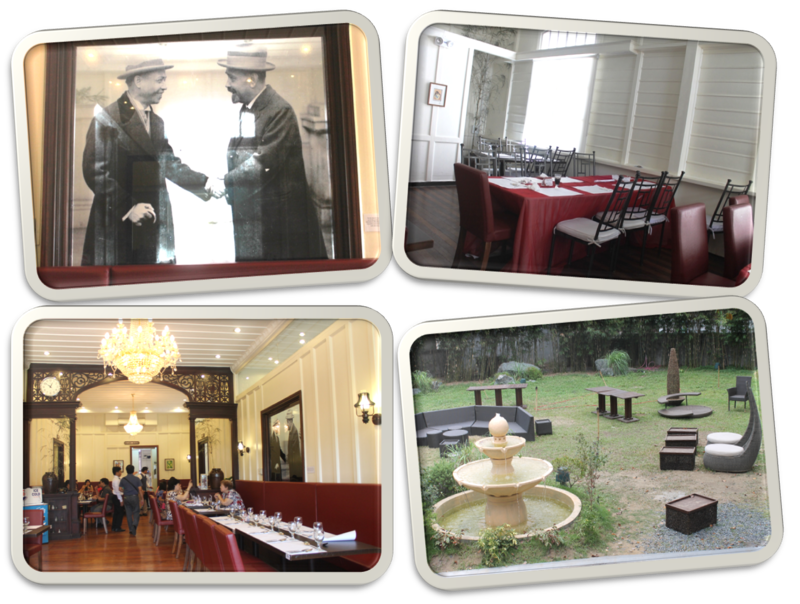 On that occasion they had Annato rice and steamed pandan rice, in some days they would have Tuyo rice and Paellas. 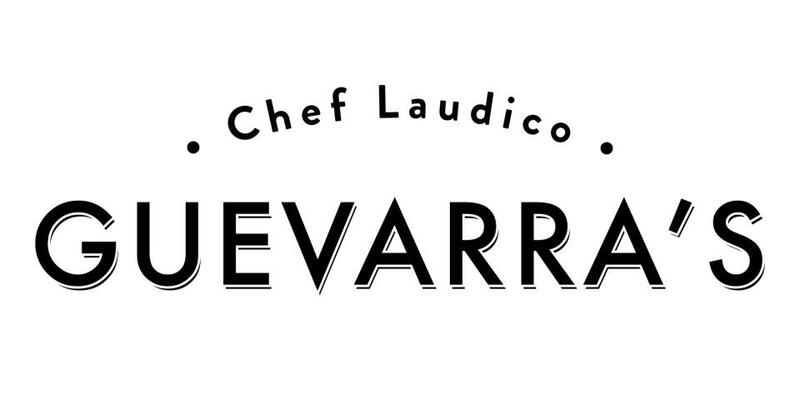 According to Chef Jackie, it was fun managing the menu of Guevarra's unlike Bistro Filipino (which they also own plus The Pugon Roast at Ayala Triangle), which is ala carte. Everyday at Guevarra's is a surprise, much like the usual birthday celebrations of old aunts and uncles where only specialty dishes from the ancestors are served. The chefs have all the freedom to choose which dishes to prepare for the day, with the pure guidance from the Laudico couple, of course. 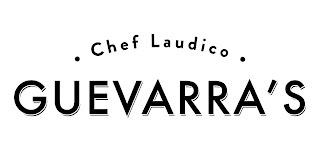 The simplest idea of naming their new baby as such comes from Chef Jackie. According to her she often gets lost when going to places when driving on her own. Clever in her ways, since the place they got is along P. Guevarra St., she thought that it is the easiest way to remember a restaurant and even the street, not disregarding the rich history of San Juan. I think P. Guevarra Street is the next Kapitolyo, Pasig or Jupiter Makati, where new restaurants and whole in the walls are popping up. A festive spread is not complete without "panghimagas" or desserts. 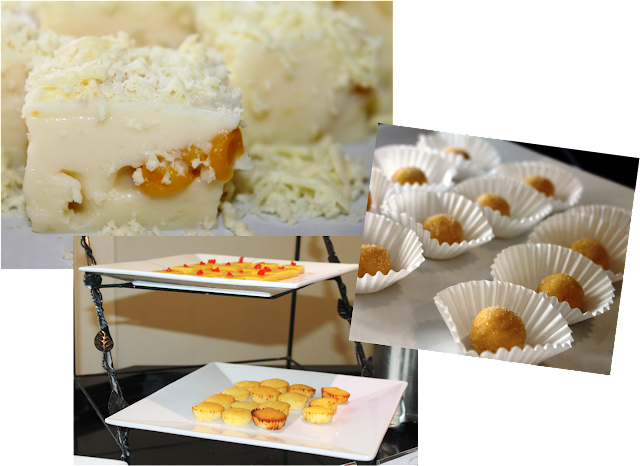 Their dessert line is a delightful rendition of Filipino delicacies with the touch of modernity, Chef Jackie's prowess. 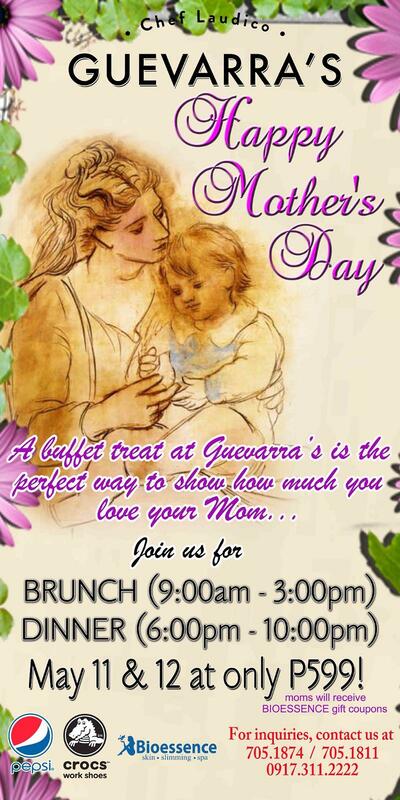 A message of advice, do come here with stomachs empty and hearts full of loving memories from your Grandma's. Make sure to take note of the restaurant time. They open daily at 11 am and closes down at 2 pm for lunch, then operation continues at 6 pm till 10 pm for dinner. weekend lunch and dinner (Friday to Sunday) of P 599, don't you think it is such a steal? 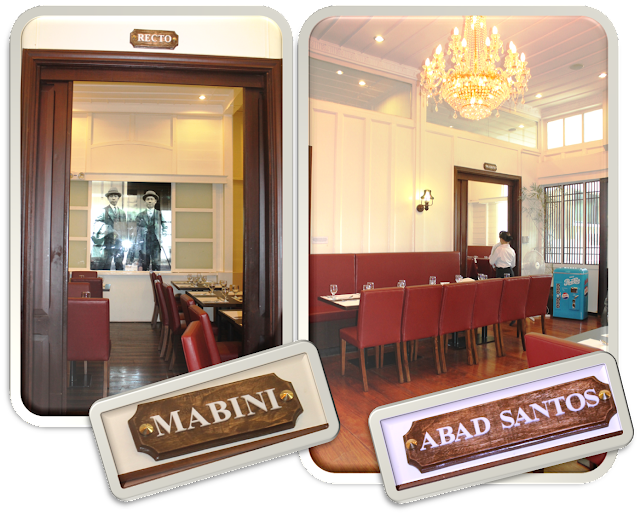 Also, do make sure to call for reservation first, because they can only accommodate up to 200 pax. And getting seats is hard for many of the Laudico's clients have been quite informed about this and since they have opened up they are always full. 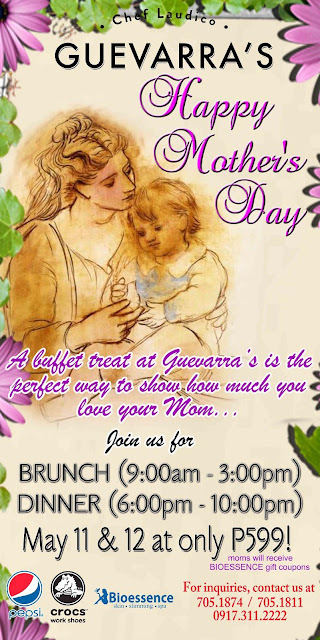 Since it's Mother's Day and I have been thinking of my mom, sisters, aunts and lolas let me share Guevarra's Mother's Day promo. What all that for lunch for only 400? That's a steal ha! Waaa! Enticing food and enchanting place! <3 Would love to try that! I like the homey ambiance as it feels like a family feast here. so disappointed. walang sistema. we waited for more than 2 hours galing pa kmi probinsya just to tell us na may nakareserve. sana before pa sinabi na at ng hindi kmi naghintay sa wala. mga nasareception suplada at walang manners.